I love the Triangle Transparency pattern so much that I decided to create another quilt to share with you today! 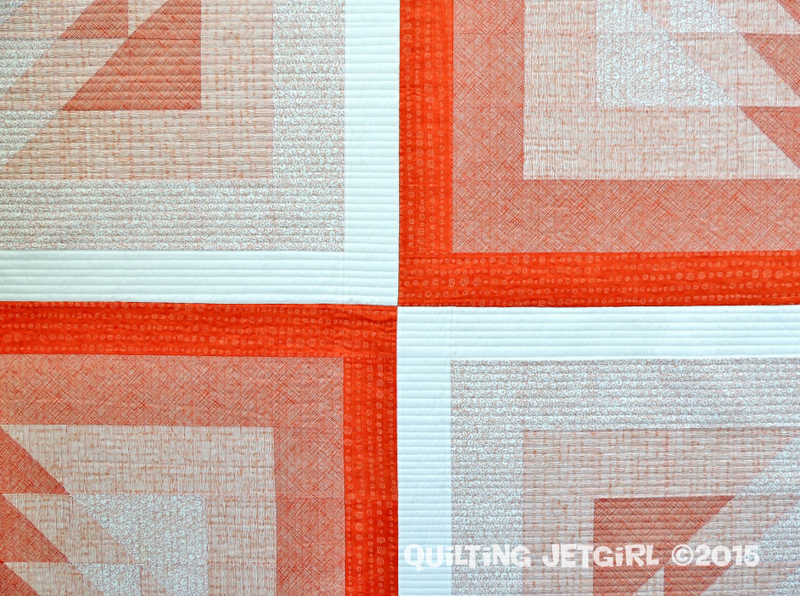 I knew I wanted to do something special with the bundle of orange Carolyn Friedlander fabrics that I picked up at QuiltCon, and I realized last week that the Triangle Transparency quilt would be the perfect pattern for these fabrics! I only (?) purchased a yard of each print, so I knew I was going to have to get a bit creative on my use of the fabrics in the pattern. I decided to create a two-color option, but instead of the quilt going from light to dark or dark to light, two blocks are light to dark, and two blocks are dark to light. I kept track of my time when making this quilt, and let me tell you I am really excited to say that the pattern and quilt can really come together quickly for a 60-inch square finished quilt! I used some of the Aurifil thread from my first Massdrop purchase in the quilting. In the light blocks I used 50wt Aurifil 2311 (Muslin) and in the dark blocks I used 50wt Aurifil 2220 (Light Salmon). I loaded the quilt onto my long arm and basted it down and quilted the light blocks with straight lines separated every half-inch or so. Then I unloaded the quilt and rotated it 90-degrees to quilt the dark blocks. I was not sure my idea about rotating the quilt was going to work out very well, but I am pleased to say that there was no excess puckering from this method (I took my time and was super careful, though!). I used the fabulous extra Kona Snow that I was so lucky to unexpectedly receive a few weeks ago for the backing. This quilt makes me think of my time at the University of Tennessee. The bright poppy orange colors represent both the “home” and “away” jersey colors and also make me think of the checkerboard pattern in the end zone of the football field. Even if you aren’t a UTenn fan, maybe the color variation might inspire you to play with color transparency in a quilt, too. Thank you so much for following along on the Triangle Transparency Blog Hop this week! I have really enjoyed seeing the beautiful quilts that the pattern testers created, and I hope you found some quilting inspiration in their quilts and blogs. And don’t forget that the Triangle Transparency quilt pattern is currently available for sale in my Craftsy, Etsy, and Payhip stores for $6 through Sunday, April 12th, which is a savings of 33% off of its regular price. Linking up to TGIFF hosted this week by Sew Fresh Quilts and Can I Get a Whoop Whoop (buttons to the right) and I Quilt @Pretty Bobbins. Woww Yvonne!! I love this one much more than the green. The orange solid lines especially made the pattern really stand out! You go girl!! It’s phenomenal! I really like the contrast between the lighter and darker blocks. Definitely my favorite!! I like your version very much and also love the colours ! I’ve enjoyed your blog hop this week – the different versions of this pattern are so fun and interesting. I really like the Carolyn Friedlander fabrics you used. Did you hand stitch the binding or do it by machine? This color is my favorite of all of the Triangle quilts! Just fabulous. Great pattern. Thanks for sharing your creativity! You ROCK! Oh wow! This one is awesome, too! I love the oranges, too! I must sY thus pattern is a winner, Yvonne. You are going to sell it like hotcakes. I showed it to my friend yesterday and she had already pinned it on Pinterest! Awesome job, really. 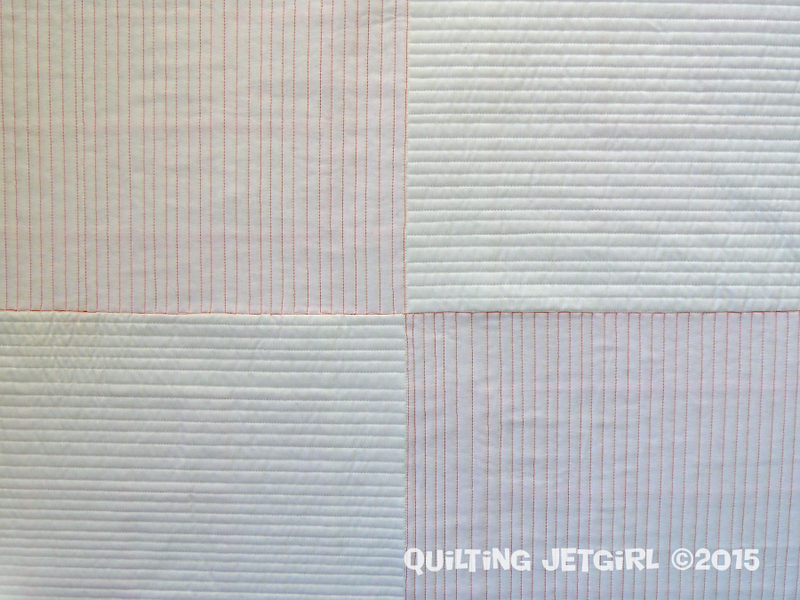 I didn’t know you could quilt straight lines on a longarm…. Love this in orange too Yvonne! Such a great and versatile pattern! I bought your pattern on the first day of the hop. I think I said here on your blog, or maybe it was in a conversation with Judy@Quilt Paradigm, that I’m thinking of using this pattern for my second nephew’s quilt, that his favourite colour is orange, and I’m not a fan of orange, but I love the pattern, so it could work out nicely…imagine my surprise when I saw your quilt in orange in my Bloglovin’ feed this morning! Ha! Thank you! What a fun pattern, and I really like it in the colors you have used. Can’t wait to see what the pattern testers have done with it! I loved the first version (one of my favorite colors), all calm and restful. Then today I love your second version, all bright and cheery (another favorite color). It is really good you didn’t have enough fabric to do the whole with one background because you created a great variation. What an awesome quilt! I love the dark and light blocks. The green one is nice, but the orange won is wonderful!! 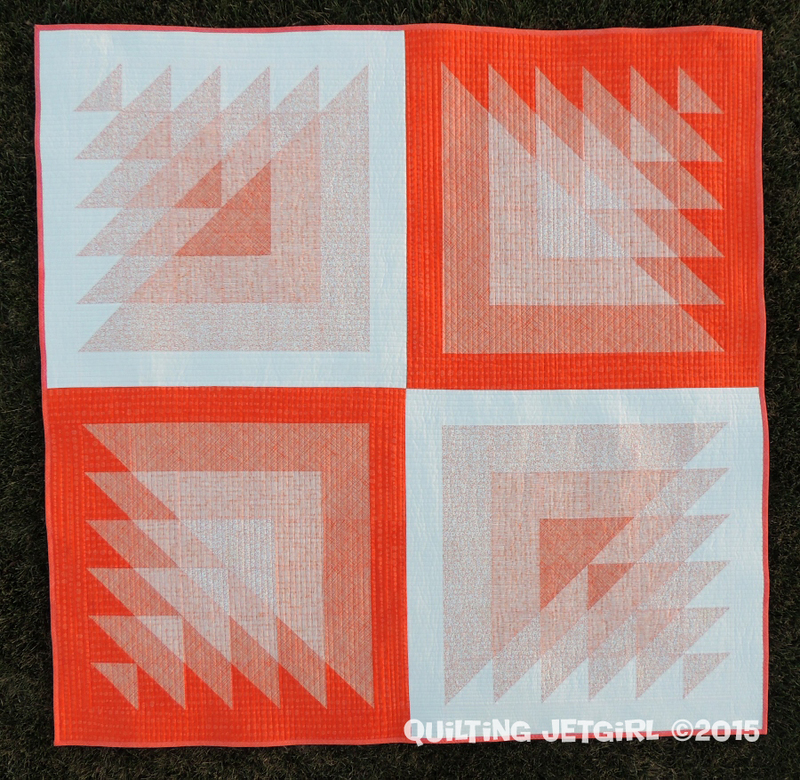 I am never really drawn to orange, but this quilt is so vibrant! I love it with the light and dark options, and the directional straight lines! 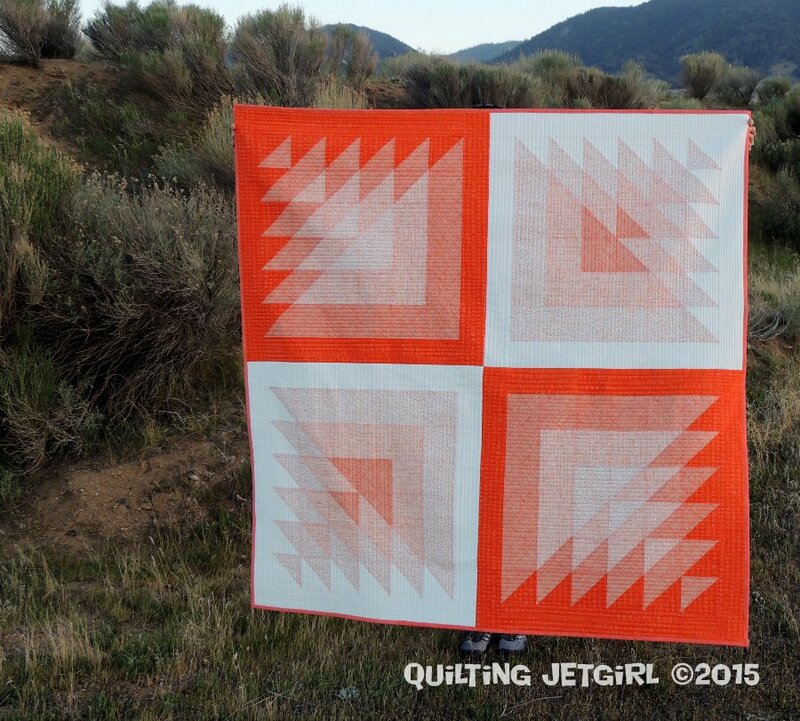 Orange is my favorite quilt, but I don’t usually use it that much in quilts. This turned out so wonderful. Really a versatile pattern. Congratulations. This is so bright and fabulous Yvonne! I love how you figured out how to use that wonderful collection of orange fabrics by alternating the light and the dark. Also love that you changed the direction of your quitting to suit. Love how the orange looks like it’s vibrating. Very cool. This is so lovely! I really like how just inverting the colors (and swapping the background color) makes such an impact with this design. Just… wow. I love the secondary pattern that comes out here (a larger diamond – see it?) This is so perfect. Congrats on another great quilt and pattern!! I really liked the first version, but this one is so cool!!! I love the oranges and the way you did the light vs. dark is great!!!! Your quilts are very beautiful! This is a beautiful design, and this orange version is gorgeous! Your fabric choices really enhance the transparency effect, and the dark verses light backgrounds add to the overall design. 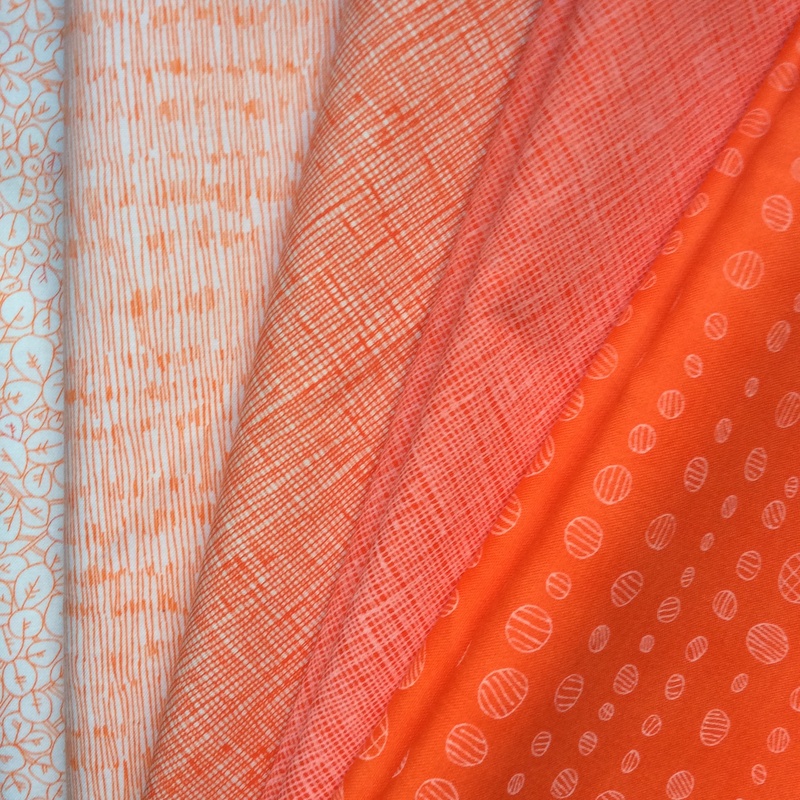 I have really enjoyed seeing everyone’s variations on this fab design and those modern orange fabrics are perfect for this pattern! Well done! I have loved seeing all the quilts from your pattern, and I think this is my favorite. Love how it has both light to dark and dark to light. Hard to resist a blast of orange – always makes me happy! Love this version! I think the original sea colours are still my favourite, but this comes a close second. And though you were right, the other quilts on the blog hop, have some jaw droppingly amazing quilting, I love your use of colour in yours and the graduation you seem to achieve effortlessly, so your two were very much my favourites. 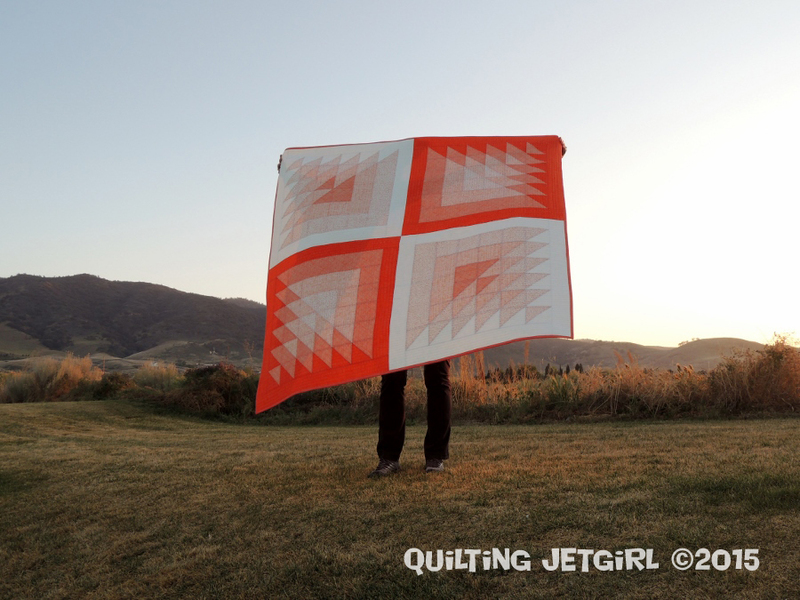 Yvonne, I just found you on 13 Spools and am absolutely blown away by this quilt! I’ve seen other transparency quilts and haven’t really liked them–but yours is gorgeous! Definitely something to aspire to! Honestly, I can’t say anything else but WOW. Simply. WOW! It’s hard to decide which colorway I’m drawn to most… but both are SO gorgeous!